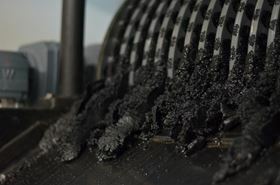 The dewatered sludge, containing all the pollutants, being scraped off the magnetic drum. ​The Norwegian ​wastewater ​company, ​ Mivanor AS, is set to launch its magnetic particle separation (MPS) technology in the European market in 2019 and will showcase it at Aquatech Amsterdam in November. The process, called MivaMag, was first developed by the company’s chief engineer, Robert Tarasz, in 2015 and is a ​mechanical ​water treatment which uses magnetism. Using magnets in the technology means that pollutants are removed from the wastewater at the same time as the sludge is dewatered. Results recorded so far show that MivaMag reduces between 50–70% of organic pollutants, 25–95% of heavy metals, 80–90% of phosphorus and 70–90% of the suspended substance. The treatment is constructed in modules to fit into existing systems and allow on-site construction.